Whether you need hanging ladder fillers or standing panel fillers, jumps online has exactly what you’re looking for. Show jump fillers are great for filling space in a show jump, and with our high quality range of jump fillers, you are sure to get the best jump filler for show jump.The Jumpsonline filler range comes in a variety of shapes, sizes and designs. All our standard designs come with an option of 1.8, 2.4, 3 or 3.5 metre widths and either 450mm or 650mm heights. Choose from different colours and sizes to get the right jump fillers for your needs. Ladder fillers come in our full choice of coloured frames and with slats in either black, white or a combination of the two as shown below. Please click on the images below to choose your size and colours. Panel fillers come in our full choice of coloured frames and with a choice of any graphic design on both sides. Please click on the images below to see some of our popular designs and to then choose your colours and sizes. A Jumpsonline representative will confirm your rear design after you have placed an order. 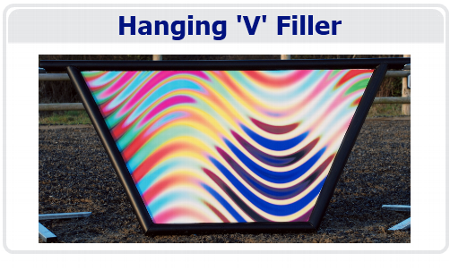 Our 'V' Fillers come in a width of 1.8 mtrs and heights of either 600 or 900mm. All 'V' Fillers come with a choice of designs on both sides. Please click on the images below to see some of our popular designs. A Jumpsonline representative will confirm your rear design after you have placed an order. We can also create for you any variations or personal designs. Please contact us for a quote. At jumpsonline, we offer an unrivalled range of vibrant, full colour designs for your jump fillers. Most designs are available in any size and colour combination from our extensive range. Click through the pages to see all our show jump products including complete show jump courses, full jumps, jump poles, jump fillers, jump planks, jump stands, jump wings, cross country jumps and much much more. All our show jumps are made with the finest materials for versatility and durability. We stock many of our show jumps, but can also design unique jumps to your specification.